Christmas With a Baby | Little Head to Toe | For the Joy of Life. Aren't you just dying at that cute little face? Gosh, I love that child of mine so very much! 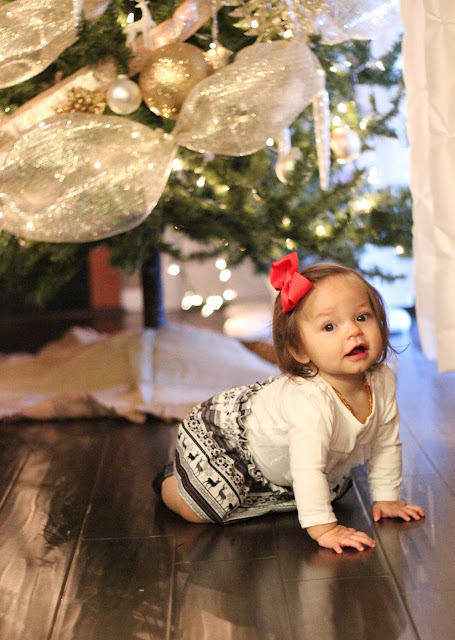 She's at such a fun age where she's curious about everything and just wants to explore all the time. I've been having so much fun experiencing her first Christmas with her. 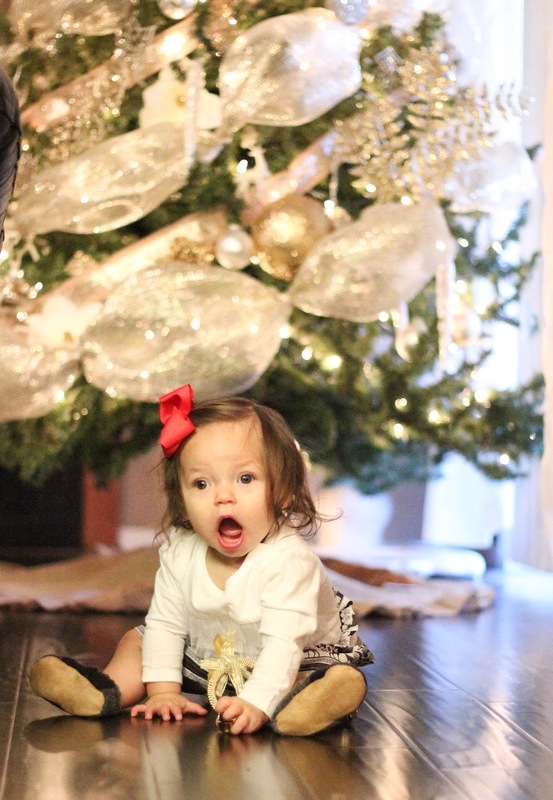 It's just so fun to see her reaction to all the lights, holiday music, sparkly decor, and fun events to attend. 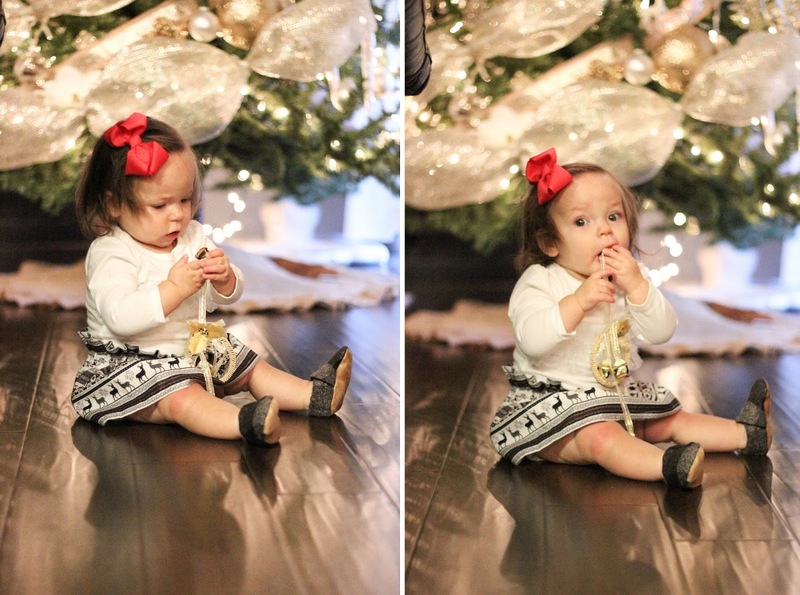 "No worries mom, I'm just gonna make sure these decorations taste okay!" Oaklyn "helped" me do a little extra decorating the other day and I couldn't help but stop and laugh at the fact that it was taking much longer than it did last year with this little girl tearing everything apart! Her favorite decoration has definitely been these jingle bells that are made for a door but have made their way into Oaklyn's toy box ha. 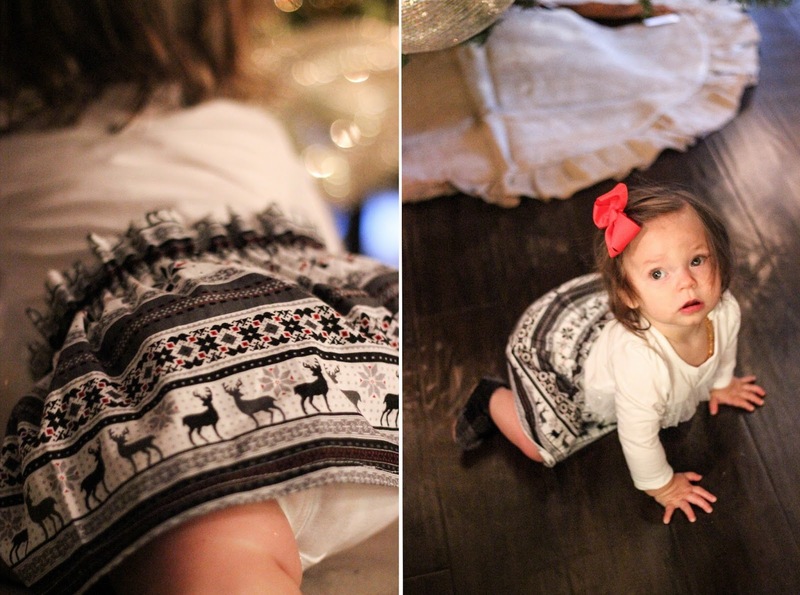 Oaks has figured out how to crawl just about anywhere so she constantly has red knees. Her little toesies are always getting cold because she will not keep shoes on, ever, and her socks just make her slip all over the floor. I'm so excited about these cute baby shoes from Little Head to Toe that keep her feet warm as she's exploring and during this Holiday season that also actually stay on her feet. I LOVE the cute plaid design and the neutral color that goes with several outfits. Oaklyn isn't a huge fan of dresses but all I want to put her in this Christmas season is cute holiday dresses for every picture! Wearing a skirt is just as cute, and in my opinion, much more functional! I'm able to keep her in a onesie so she can't rip her diaper off or expose everyone but she still has the adorable feminine look of a dress. This is skirt from Little Head to Toe is hands down my favorite skirt she owns and you better believe you'll be seeing it in several holiday photos! I'm loving everything about the print and colors and the fit is the cutest! I fits just right with the elastic waist band and has just the right amount of fit and flair. I'm so excited to put Oaklyn in some tights and put this skirt on as well. I can just picture it already! Her chubby little leg rolls look so darling in tights! 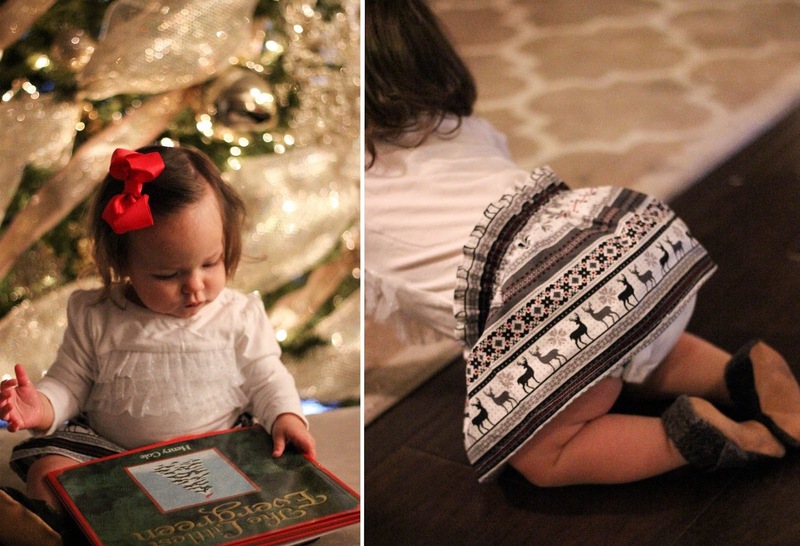 We've had so much fun reading Oaklyn her Christmas books. Our favorite so far is "Olive the Other Reindeer"
We already bought our Christmas jammies and we are finalizing dates to go home for the holidays. 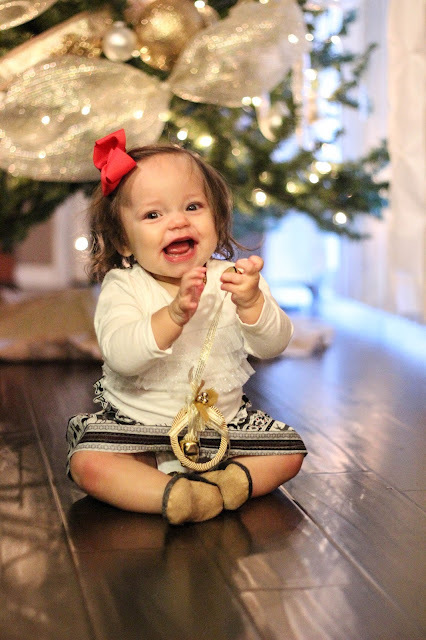 Oaklyn gets to meet Santa soon, our Christmas party is coming up, the stocking are hung and the tree is decorated, I've been constantly sipping hot cocoa, and the chill in the air is making me so happy. "What?! Did you Say a Giveaway?" You sure bet I did! Little Head to Toe is giving away one lucky Instagram follower one item of their choice! On this Christmas I want to gift these type of shoes to my sisters son. Looking for new Basketball Sneakers? Be sure to check out our tips & advice on selecting the perfect basketball shoe! Our basketball sneakers buying guide will ..
Oaks has made sense of how to slither pretty much anyplace so she always has red knees. Her little toesies are continually getting icy since she won't keep shoes on, ever, and her socks simply make her slip everywhere throughout the floor. Aren't you simply biting the dust at that charming little face? Gosh, I adore that offspring of mine so in particular! She's at such a fun age where she's interested about everything and simply needs to investigate constantly.